This forum was convened so stakeholders from various parts of the water sector could get a shared understanding of the situation for groundwater in India and formulate the first steps to managing various emerging challenges. The forum was attended by 52 people including senior policy makers and resource managers. Topics of discussion included groundwater governance and management in India, and the idea of groundwater in India as a hidden treasure. 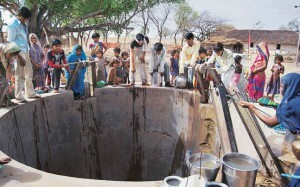 Overall it was noted the over-exploitation of groundwater in India was a real issue and water management, including policy and legal reforms, was the key to solving problems.